First pic of Proloquo2go on iPad has been seen online. Proloquo (pronounced Pro-low-quo) is latin for ‘speak out loud’, ‘2go’ means mobile. Because iPad has a larger screen, users will be able to use grids of up to 64 items. Proloquo2Go also now supports all device orientations allowing users to hold iPad any way they like. I have been told they have made enhancements for people wanting to use it as a text based communication system also, so words/sentences are centered when icons are removed. For someone who is able to touch a screen for input why pay £5,000 or have to wait up to 12-18 months for funding, if you can get one for under £500 by putting Proloquo2go on an iPad, iPod Touch or iPhone? 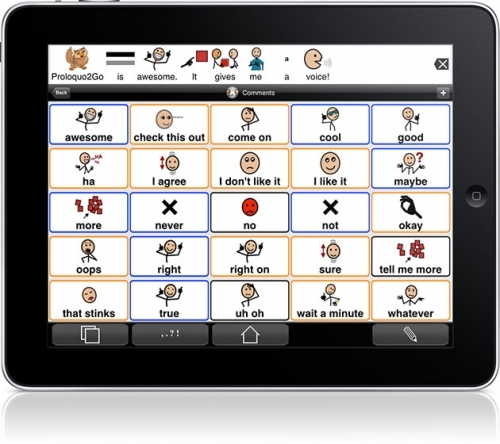 Users and speech-language pathologists love Proloquo2Go and even though it has been on the market for less than a year (on iPhone/iPod Touch). It has been highly popular amongst children and adults who are still mobile and/or have the fine motor skills needed to use the smaller screen. It is completely customisable for individual need whereas some dedicated devices have pages where vocabulary is set and allow more limited options for individualising the device. As a person with Ataxia who struggles to send basic text messages on my Blackberry trying to use the small iPod Touch or iPhone for communication would have proved too difficult and tedious so I was delighted when the iPad was announced and that it would run apps from iTunes as I relaised I would also be able to get Proloquo2go and finally have a ‘jumbo iPod Touch’ to also use for downloading captioned videos and accessing other apps and games that I have heard so much about. I am hoping to be able to get one when they are released in the UK, so please do come to check this space in a month and I’ll put up pics of my own page designs. Hi, Looking forward to seeing your pictures. we would like to switch my 5-year old son from a Dynavox V to an iPad with P2G when it comes out here in Canada later this month. We are looking at making the same switch. if you go to facebook and look up Prploquo2go, and look for a string where I asked for some input on this thought, I received many useful comments on the thread. Feel free to friend me on facebook, so we can stay in touch on our progress in this transition. Hey you guys did you see my latest blog page with the new screenshots? just click on the title banner to get to latest blog. I have done some more recent blogs about the iPad and P2G also, after I got my own. click on banner at top of page and scroll down. It was on first page before yesterday but now 2nd and 3rd pages are review on ipad accessibility for people with fine motor difficulties and review of the app Proloquo2go. Hey Kati, I have been following your blogs, but missed these comments! thanks for all the info. And Mark, thanks for the info about teh Facebook discussion. I will look it up today. We are currently getting ready to move from Toronto to New Brunswick, and moving from Canada’s largest city, where funding is pretty strong for equipment to a small town in a small province, we have been worried about funding for things like this. Eric’s dynavox was on a lease through the Ontario government, but when we leave the province, we have to give it back. We were stressed about what would happen next, but put in a request to the school board in the town where we’re moving and they agreed to buy the iPad and P2G for Eric at school (and he can keep it at home as well, and we will get it as soon as we move there, rather than waiting until school starts in September). So I’m very excited about reading as much as I can to make the transition from Dynavox to iPad as easy for Eric as possible. How did you go about putting your request through the school board? did you have to go through an OT or a speech therapist? I am an OT in Ontario trying to get these into some of our schools! Great news about your son getting the iPad and P2G. Hope he enjoys using it. Is there a download on dynavox for the mayer-johnson symbols that maybe you can add onto P2G and make his own pages? The symbolstyx ones are fairly good for kids though. I love the branded drinks in the drinks section, although I’m still looking for something that resembles a yorkshire pudding in the food category… lol!! I am a 55 yr old desk worker, quite dependent on the computer. I have ataxia (SCA1) which is progressive. I am very interested in these technologies. Now trying Dragon Naturally Speaking for a start. My office paid for it – good for them. BTW, am in Toronto. Mark/Lloyd, hope everything goes well. I am also one of the Community Managers for Living With Ataxia, you are welcome to join if you haven’t already found it by now. hey, I just downloaded this word prediction Ipad apps that is just released. It seem not bad. You may like to check it out. hi kati thanks for the info i have a sl40 connect but im trying to find something cheeper than roll talk which le go on the net when i cant move. rolltalk would mean a reasesment for mobility and speach but i havent an o t or speech thripst now so im stuck an ipad with assistive chat ect woul help and be so much cheaper. you can see a more recent update of the new word prediction system on P2G in typing mode. you type a sentence once end with full stop or punctuation ie question mark and it adds it and remembers, does single word, multi word, sentence prediction same as the keystrokes app for mac (made by same company) . They will be adding abbreviation-expansion too in future updates but for now you can just create a page in gird mode of frequently used sentences to save typing things out each time which dont vary ie address, explaining condition etc. I like your blog . Good keep it up !